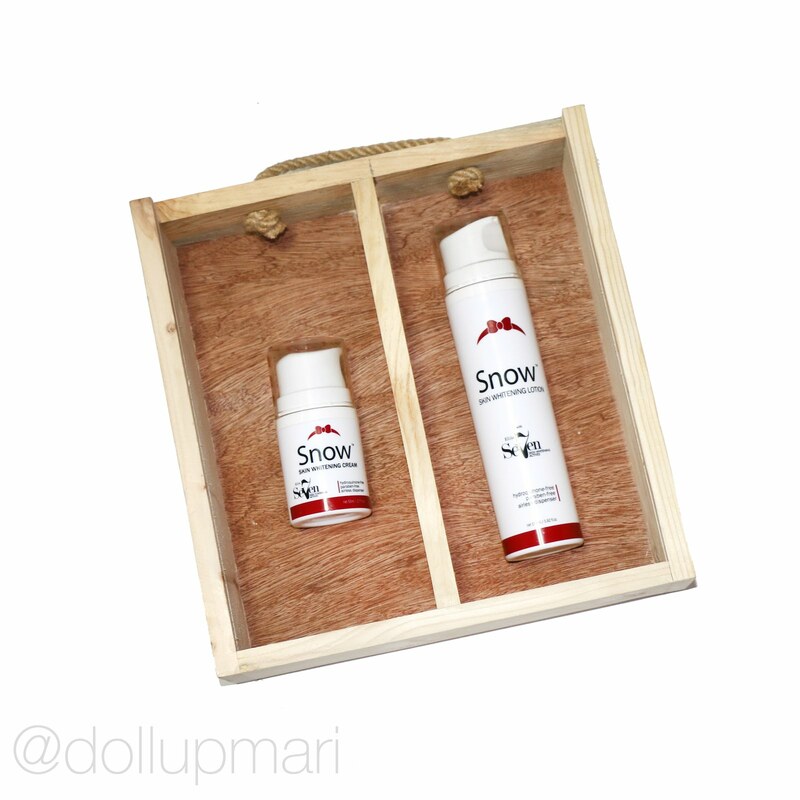 I never thought I could still lighten up with anything topical until I tried Snow Skin Whitening lotion. Snow Skin Whitening Cream is made by Vida Nutriscience and retails for Php1499 at Mercury Drugstores nationwide. Each bottle is 50mL and comes in a pump bottle. There are 7 Elite Skin Whitening Actives that work their magic. The 7 actives are as follows: 1.) IBR TCLC (Tomato Colorless Carotenoids), 2.) IBR Snowflakes, 3.) 7 Plant Extract from the Swiss Alps, 4.) BearBerry Extract, 5.) Alpha Arbutin, 6.) Beta Glucan, and 7.) Phenylethyl resorcinol. Each substance comes together to form a mousse-ey cream that seeps into the skin's layers, making one glow from within. When you apply this product, it will act a lot like CC Cream and spread out and leave a white cast and everything. But once it sets, even if you wipe or wash your face, a white cast will stay and will not disappear until you stop using the product for about a week or so. If there is eyebrow tint and there is lip tint, think of this as CC tint. If you want to wake up with a natural glow or want to use something less oily and more nourishing than a CC cream, then this product is for you. The lotion also has the same active ingredients as the cream, but is a little runnier and has a texture more apt for the body. This retails for 799 for a 175mL bottle. So my feedback is that this has a cologne like smell, a pleasant one if you ask me. Both lotion and cream have reasonably light textures that are easy to blend in and easy to absorb. I honestly liked the glow that both products gave, but I will be honest that this is not a way to permanently whiten one's self, nor is any other whitening product a way, for that matter. You have to be using this regularly in order for your skin to be constantly exposed to the active ingredients and therefore show the desired effects. This product will not work for people who will use this for a few days then stop for weeks or months and expect that whatever whitening they had achieved will stay the way it is. You really will go back to your former self if you stop using this for an extended period of time. I personally like to use this at night so that I get the glow that I want in the morning, and also because I like to pile on more products at night so that my skin has a good amount of time to absorb them. However, you may also like to use this during daytime before or after your sunscreen (as this has no SPF) in order to be able to have a CC cream kind of glow as your base. Personally, I feel that the cream is really good as it can work two functions (as skincare and as base makeup). The price (1499) doesn't sound crazy to me either as this is usually the price of skincare products of this amount and calibre. Given how little one needs to use each time (I use just one or two pumps of the product everytime), this will be good for perhaps two to three months or even longer. However, for the lotion, I am still coming to terms with justifying the price. Yes, it is good, yes it can whiten. But come to think of it, given my lotion consumption, I can use one bottle for just like a month or even less. Php799 per month for lotion consumption can be quite steep, more so that I can already use the same kind of money to buy the biggest SKU's of regular lotion brands to last me about 6-8 months. One will probably need to use this with other lotions in order to be able to use this longer and justify the price. Or one will also need to invest in very good sunscreens in order to protect one's self from the sun and not reverse the good effects of this product. However, I still do think that for best effects, it's ideal to use both at the same time. Brands of course create products that are engineered to work together to provide the maximum effect. I personally just like the cream more than the lotion. For those who are thinking of buying the lotion to use as face cream, I won't necessarily recommend it because it's runnier than the cream. I don't think it will be a pleasant usage experience. We don't really put lotions on our faces so there's that. I really would recommend one to really use the cream, even if it's pricier. As seen in my video, it really does its job, so I think the price is justified. That's a nice experienced you have upon using this kind of whitening skin products. i'm glad to see some of your positive results while using this products. I've been doing a lot of research with research paper writing services reviews about skin care products and it was good to say that some of the research that I made was very successful. Hindi ba oily yung lotion Ms. Mari? looks good when applied, lakas maka flawless haha! kaso nga lang pricey masyado.